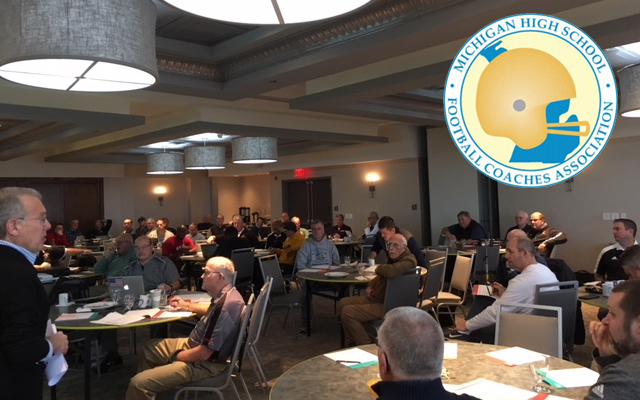 The Practice Like Pros video clinic was received with unprecedented fervor Friday in Traverse City, MI, by the Board of Directors of the Michigan High School Football Coaches Association (MHSFCA). As the meeting began, Michigan was one of the more permissive Midwestern states, allowing 15 days of full contact in pre-season, four full-contact scrimmages and 90 minutes of full contact per week in regular season. The PLP presentation to coaches' associations and state governing bodies is generally followed by weeks/months of deliberation. But Friday, when PLP founder Terry O'Neil finished, MHSFCA executive director Larry Merx took the floor and said to his Board: "Gentlemen, you've heard the proposal. We all know the issues. This is our opportunity." 15 minutes per week in regular- and post-season. The MHSFCA thereby became the third statewide association of coaches, following New Jersey and Connecticut, to refer this type of proposal to its governing body for adoption. The group also invited O'Neil to make two presentations to its full membership -- more than 2000 coaches -- at the annual MHSFCA Clinic, January 17-18 in Lansing. "We've never had the concept approved bam!, on the spot, in the meeting room," said O'Neil afterward. "God bless these guys, they know what's needed in high school football and they weren't afraid to act." High school football participation in Michigan has declined by 8,203 players over the past eight years, leaving the state with fewer than 35,000 players. Board member Jerry Rabideau, highly successful coach of Spring Lake High School, said, "We've been talking for a few years about player safety and declining participation. We've been looking for the correct step to take, and this is it." Despite years of safety awareness campaigns from various advocates, most high school football head injuries still occur in practice, not in games, according to the latest research. Scientists from the University of Texas Southwestern Medical Center in Dallas andWake Forest University School of Biomedical Engineering last week released their findings at the Radiological Society of North America (RSNA) annual meeting in Chicago. Cohort for the study was a group of 60 high school football players. Principal investigator Gowtham Murugesan reported, "Most of the head impacts occurred during practice." Practice Like Pros is an IRS-approved 501(c)(3) charity, EN number 46-2994162.